As some of you already know, Metro’s Service Councils this month are holding public hearings on proposed bus service changes to take effect in June. The above staff report details all the changes, including maps of proposed bus routes. •The creation of a new 588 bus that would operate at peak hours that would run between Westwood and Nordhoff Street, mostly along the 405 freeway and Van Nuys Boulevard. This new line still requires funding. 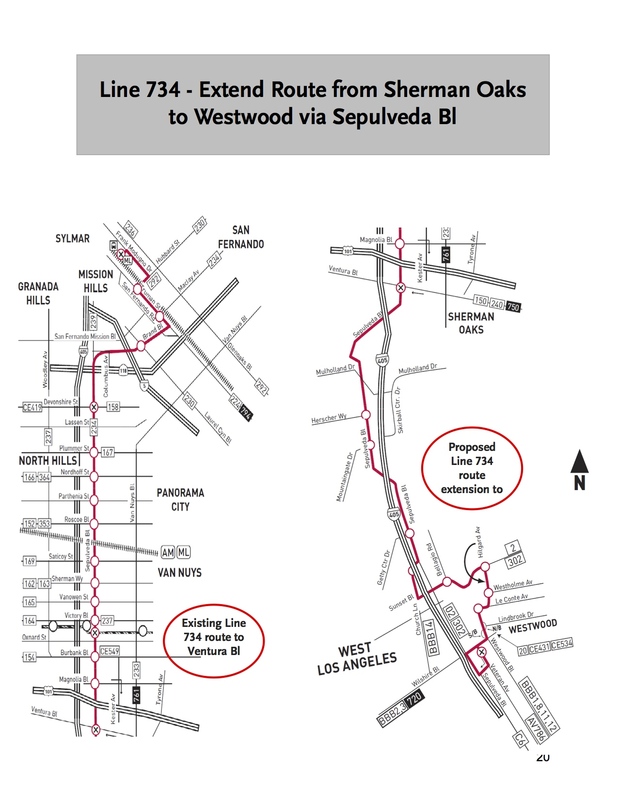 •Extending the 734 Rapid Bus to Westwood via Sepulveda Boulevard, thereby creating a bus line that would run from Sylmar to Westwood. Of course, better connecting the Valley and the Los Angeles basin has long been a challenge for mass transit in Los Angeles County, owing to the barrier that is the Santa Monica Mountains. The Red Line does run between North Hollywood and Union Station in downtown Los Angeles, but that doesn’t really help connect the Valley to the Westside. Metrolink also offers two commuter rail lines between the Valley and downtown L.A., but that has two sets of challenges: 1) expense and frequency of service, and; 2) also no service to the Westside. One of the projects designated for Measure R funding is the Sepulveda Pass Transit Corridor, which aims to connect the Valley and Westside, with a study area that runs from Sylmar all the way to Los Angeles International Airport. A rail tunnel is among the options identified during early studies although that will need more than the $1 billion supplied by Measure R. Also being considered is a public-private partnership to supply more funding. In the meantime, Metro is trying to find the best way to connect the Valley to the Westside via bus service. The 588 proposal is interesting because it would take advantage of the new northbound HOV lane that is being built on the 405 as part of the I-405 Sepulveda Pass Improvements Project that is scheduled for completion this summer. Metro’s current 761 Rapid Bus doesn’t use the freeway — it only runs along Sepulveda Boulevard. The SFV Service Council held a public hearing to receive public comments on these proposed bus service modifications last Wednesday, as well as a hearing at the Metro Gateway Building on Saturday. A total of 26 people provided comments. There will be three more public hearings held this week; tonight at the San Gabriel Valley Service Council in El Monte at 6 p.m., Westside/Central in Beverly Hills at 5 p.m. on Wednesday (Feb. 12) and Gateway Cities in Huntington Park at 6 p.m on Thursday (Feb. 13). More on meeting locations here. Please check the metro.net for details on the location and public transit options. Interested persons can also provide their comments on these proposed changes thru Friday, February 14 via Metro Customer Relations. The Metro Board of Directors are scheduled to consider the changes later this spring. Its frustrating that bus changes that actually INCREASE bus line services cannot be implemented IMMEDIATELY! This “Line 588”, while a great idea, appears to be just a “tease”, given that it is allegedly tied to “funding” (perhaps eliminating all of the “Art projects” the MTA wastes money on would be enough “funding”?). The fact that TWICE A YEAR, is the best the MTA can do for service change IMPROVEMENTS, is pathetic! ANYTHING that improves the efficiency of bus service, or increases ANY bus line service should be implemented IMMEDIATELY! Not twice a year! I don’t know whether my suggestions I gave Metro over a year ago for a bus route was an influence on the proposed 588 line, but I’m glad to see that they are willing to try something new. My suggestions centered around using the excess parking capacity of the Orange Line Sepulveda station as a park and ride (much like the Red Line stations) for a route along the 405 to Wilshire Blvd. I also suggested that it head west on the Orange Line route (Metro doesn’t seem to like mixing other bus lines on the Orange Line) and make a turn around at Warner Center. Overall, I like what they have come up with for the proposed 588 line. It gives a fairly direct and fast route from the Sepulveda Orange Line parking lot to UCLA. That should entice some people to take advantage of it, since UCLA encourages people to not do single occupancy driving. I should have also said that there is excess car parking capacity at the Van Nuys Orange Line station. The 588 route can also take advantage of that. 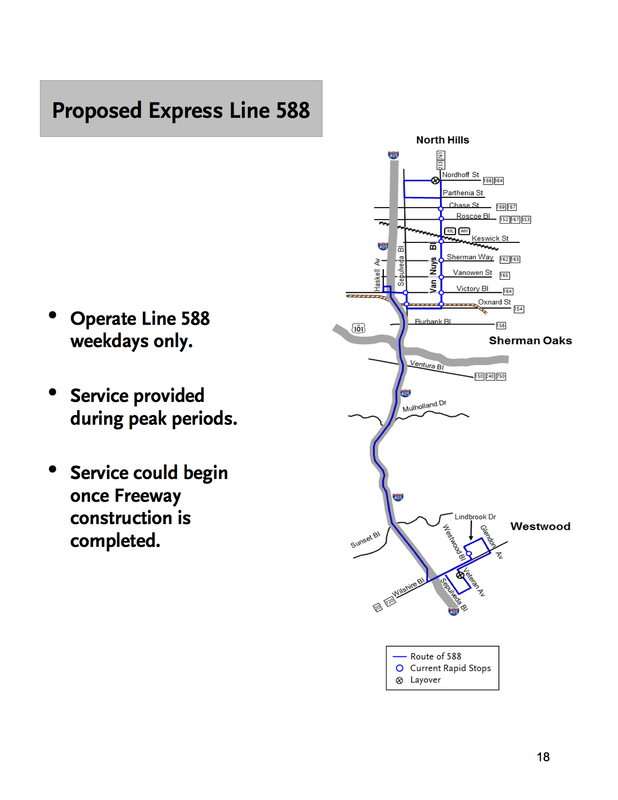 588 is basically a demonstration/feasibility run for the combined Van Nuys corridor/Sepulveda BRT or light rail… major stops only on Van Nuys until Ventura Blvd, then runs express to Westwood. The express running should shave about 20 minutes off current 761 between Westwood and Ventura Blvd. If this bus is not packed to the grill during rush hour, I would be surprised. Art projects get a small fraction of the Metro budget, and likely isn’t eligible for operations. Saturday at the hearing I suggested Congestion Mitigation and Air Quality Improvement funding be considered for the 588, at least for the first two years. One of the biggest complaints I hear from my bicycling buddies is that it takes a long time to get a bus over the Sepulveda pass when many other bikers are trying to do the same thing. This should help them out. Can’t wait until my grandchildren can enjoy a subway or train that runs to that area, though. If you may eventually run this Line 588 between the valley and Westwood as the bus gets off the freeway have you considered having a stop on the other side of the 405 freeway for people going to the VA Hospital.. I used to work there and I know quite a bit of employees that work at the VA and live in the valley. It has to go further than UCLA. It needs to go to about I-10, then head into the heart of Santa Monica. That would connect the major job centers with valley. A much more bold plan would have it go all the way to LAX and then into El Seguendo on Sepulveda. I totally agree with the change for #734, as it would FINALLY continue down Sepulveda Bl from Magnolia to Ventura and then down to the UCLA area!!!! Whoever designed the Express Line 588 route cleverly combined the need for additional passenger capacity at peak hours along Van Nuys Blvd to the Orange Line while picking up passengers that drove to the park and ride lots at Van Nuys and on Sepulveda Blvd. After that, it makes one more stop on Sepulveda before getting on the freeway to UCLA. This makes a fast route, with few stops, for people who would usually drive to UCLA. A fast and shorter route enables more trips per each bus driver during peak hours, which lowers operational costs. I fully second Just a person’s comment–an express bus service is needed between the Valley and Downtown Santa Monica. In particular, a route that traveled I-405, exited at Olympic Bl, then traveled Olympic Bl to Downtown Santa Monica. It would pass by several major job centers located along Olympic. In the future, the line could perhaps end at the forthcoming Expo Sepulveda station. Olympic Bl. west of Century City is Santa Monica Transit and Culver City service areas. This proposal is a step in the right direction towards bus transit between the corridors, DC, I agree with you, I believe there needs to be a connection between Santa Monica and the Valley. 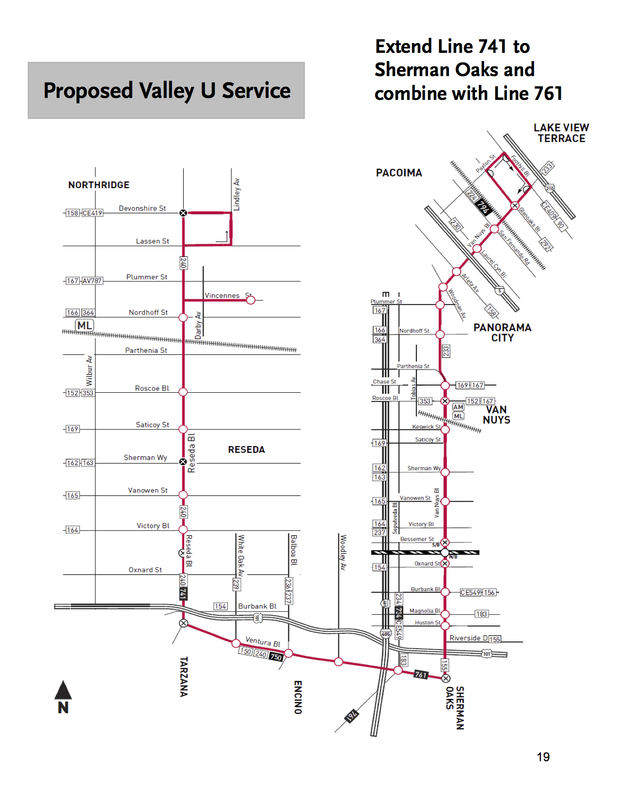 The one thing I would like to see for the 588 route would be the connection it would make to the California State University campus on it’s AM run to the valley since it terminates on Nordhoff. Rider comments really have NO IMPACT on what the MTA will do regarding bus line changes (e.g. Line 577-the service to Rio Hondo College was supposed to be a “six month experiment”, and two months into it, its being proposed for “permanency”! What about the “experimental period of six months”?). The MTA will do what the MTA will do, regardless of what bus riders want, suggest, like or dislike! Its not like the rubes making the decision HAVE TO RIDE THE BUSES IN ANY CASE!